Global trends in obesity. Part 1 Contributing factors: Nutrient–gene interactions contributing to the development of obesity; Energy metabolism and obesity; Physical activity and obesity; Childhood obesity, nutrition and metabolic health; The psychology of overeating; Sensory responses, food acceptance and obesity; Portion size and food intake. Part 2 Macronutrient influences on weight loss: Energy density and weight control; Dietary fat and weight control; Carbohydrates, glycemic responses and weight control; Protein intake and weight control; Alcohol, energy balance and obesity; The use of fat replacers for weight loss and control; Intense sweeteners and sugar replacers in the regulation of food intake and body weight; Dietary fibre and weight control. Part 3 Commercial strategies, functional targets and agents in weight control: Consumer determinants and intervention strategies for obesity prevention; Fat oxidation, appetite and weight control; The use of very low calorie diets (VLCDs) and meal replacers for weight control; The effectiveness of popular diets: An overview; Calcium and obesity; Community-based approaches to prevent obesity; Behavioural and metabolic targets for the prevention and control of obesity; A commercial R&D perspective on weight control foods. The global obesity epidemic is arguably the most serious health issue facing the food industry today. Food manufacturers are under increasing pressure over both the degree to which they are seen as contributing to the problem, and the role they should play in solving it. Drawing on the expertise of many of the world’s leading experts in this area, Food, diet and obesity summarises the key research on the links between obesity and diet. Topics discussed include trends in obesity, the evidence behind popular diets and meal replacers, the effectiveness of fat and sugar replacers in food, emerging issues such as the value of the glycemic index, protein content and calcium in weight control, and potential functional food targets and ingredients for weight control. After an introductory chapter on global trends in obesity, part one looks at the range of contributing factors to obesity, from nutrient-gene interactions, energy metabolism and physical activity to sensory responses to food, portion size and the psychology of overeating. Part two looks at macronutrients and their role in weight gain or loss, with chapters on topics such as energy density, dietary fat, carbohydrates, protein and dietary fibre. The final part of the book discusses issues in developing effective strategies for weight control, from gaining consumer acceptance of weight-control food products, through functional food ingredients, to community-based public health approaches in preventing obesity. 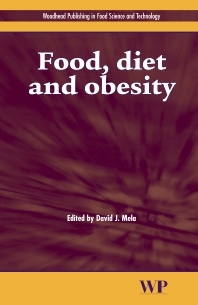 With its distinguished editor and contributors, Food, diet and obesity is a standard work for health professionals, nutritionists and R&D staff throughout the food industry, as well as all those concerned with understanding and reducing obesity. Dr David Mela is a senior scientist and leader of the Energy, Weight Control & Performance expertise group at the Unilever Health Institute in Vlaardingen, The Netherlands. He has an international reputation for his work on the determinants and relationships amongst consumer behaviour, food intake and weight control.